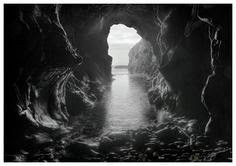 Great Sea Caves of Antrim - Bruce's cave, Rathlin Island. This is the cave that Taisie lands in near the end of the book. It is called Bruce's Cave because Robert the Bruce supposedly hid out here while fleeing the English. He saw a spider struggling to make it's way up the wall and decided it was an omen for his own struggle. He went on to defeat the English at Bannockburn.